MY SKINCARE ROUTINE || WINTER EDITION | RAWR BOWS. Hello! Winter brings the worst out of everyone, skin-wise that is. Unless you are extremely lucky and live in a warm place where even winter is not that cold (yes, I am looking at you lucky Angelenos) your skin is probably suffering the icy wind and the freezing weather in general. Mine was until I decided to to update my skincare routine to get a decent-looking skin. Here's what I do. I cannot be the only one who dreads getting out of bed, let alone wash my face properly which is why I keep things very simple. All I do is wash my face with water and then I use Insta Natural's Hyaluronic Acid Serum* before applying my make up. This stuff is really good, it does everything I need it to do - it hydrates my skin, smoothes it and prepares it for make up. All in one little bottle. And, just to clarify, don't let the word 'acid' scare you; our skin already has acid so don't worry it's not gonna make your skin fall off. What the Hyaluronic acid does is retain the water within the cells. It can retain up to 1000 times its weight in water -i.e it's an excellent moisturiser. This serum also contains Green Tea, Vitamin C and Jojoba Oil which are all great for your skin and will help it look and feel much better. To top it off, all its ingredients are natural and organic. After showering I spend like 20min taking care of my skin and making sure there is no dirt/dead skin/make up residue left. 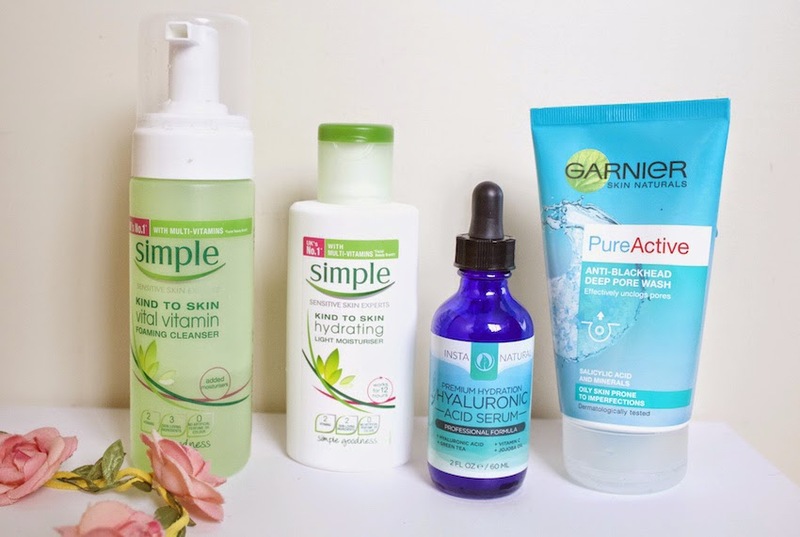 I first use Simple's Vital Vitamin Foaming Cleanser to remove all my make up, it is the only cleanser I've found that removes waterproof mascara and eyeliner without having to rub it in for hours. After rinsing my face with warm water I sue Garnier's Pure Active Blackhead Clearing Scrub which I love because it's just harsh enough to work but it doesn't irritate my skin at all. Then apply Insta Natural's Hyaluronic Acid Serum* again and let it dry before applying Simple's Kind to Skin Light Moisturiser. *this product was sent to me but all opinions are honest and mine.